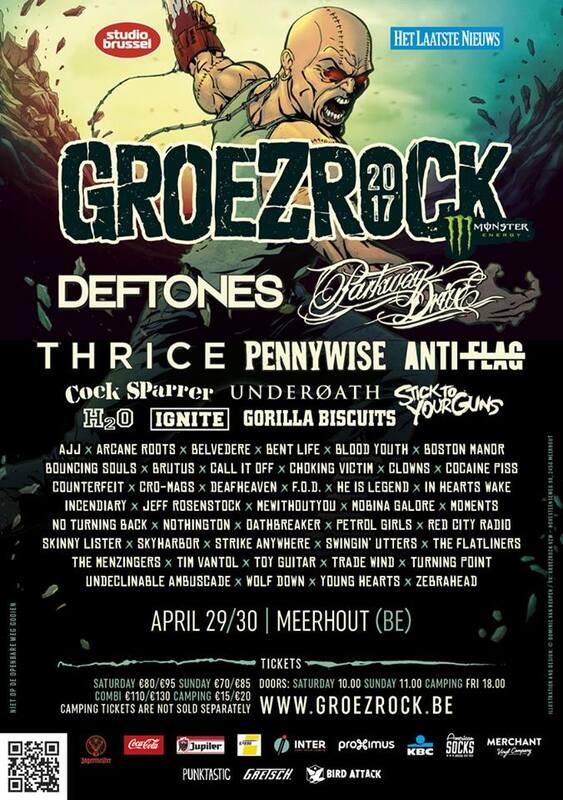 Groezrock and Macbeth have announced the winners of their contest with as absolute winner Ducking Punches. Nine others out of the thirty bands shortlisted will also be playing the Macbeth stage at the Belgian punk festival. To see the full results, please read on. Social Distortion, Lagwagon, Pennywise, Broilers, Atreyu, Motion City Soundtrack, Defeater, Unearth, The Ghost Inside, Against Me!, Title Fight, Trash Talk, Suicide Silence, Emmure, Stick To Your Guns, The Dwarves, While She Sleeps, Iron Reagan, Cancer Bats, Set It Off, The Smith Street Band, The Swellers, Whitechapel, Carnifex, Set Things Right, Toxic Shock, Transit, Gnarwolves, The Hell, Feed The Rhino, Mineral, Beach Slang, The Hotelier, Ceremony, Masked Intruder, Obey The Brave, Cold World, Frnkiero and the Cellabration, knapsack, Under The Influence, Joyce Manor + more to be announced. Refused, Millencolin, American Nightmare, Satanic Surfers, Agnostic Front, Comeback Kid, Make Do And Mend, Such Gold, As Friends Rust, Basement, Psycho44, Frenzal Rhomb, Teenage Bottlerocket, Turbowolf, Bane, Reign Supreme, Timeshares, Off With Their Heads, Turnstile, The Interrupters, Your Highness, Direct Hit!, The Holy Mess, Banner Pilot, Counterpunch, No Turning Back, The Early November, The Real McKenzies, Good Riddance, Throwdown, OFF! Diesel Boy, Raised Fist, Obliterations, F.O.D., Call It Off, The Deaf, You Blew It!, Love Zombies, FORUS + more to be announced. This entry was posted on Thursday, February 19th, 2015 at 8:39 PM	and tagged with Bad Ideas, Black Sheep, Ducking Punches, Groezrock 2015, Jarhead, Kill The President, Macbeth, Not On Tour, Shinebox, Tiger Bell, Wolves Scream, You May Kiss The Bride and posted in News. You can follow any responses to this entry through the RSS 2.0 feed.